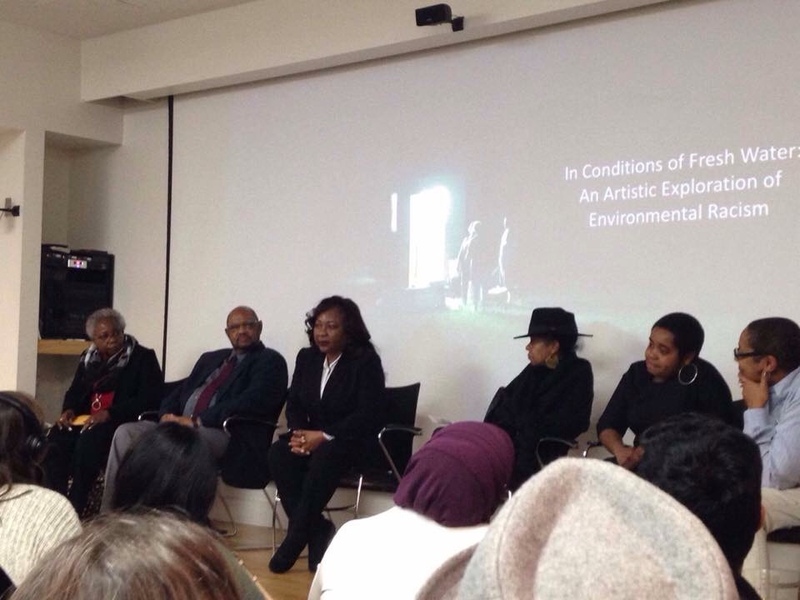 Opening panel of In Conditions of Fresh Water: An Artistic Exploration of Environmental Racism at Duke Center for Documentary Studies, March 2, 2017. From left: Brenda Wilson, Omega Wilson, Catherine Coleman Flowers, Torkwase Dyson, Danielle Purifoy, Courtney Reid-Eaton (exhibit curator). Photo courtesy Audrey Shore. For the past 10 months, Torkwase Dyson and I worked together to tell the story of water up close, through the lived experiences of Black folk in Alamance and Lowndes Counties (in North Carolina and Alabama, respectively), and at a distance, through abstract explorations of the structure and design of the places they claim as home. In just a few short days, on June 3rd, In Conditions of Fresh Water will finish its first public exhibition in Durham, North Carolina. This project a new undertaking for us both--one that stretched and transformed us both in ways that will continue to shape our work for the foreseeable future. And one that illuminates the urgency of our collective attention to Black places, not only as barometers of the health of our collective global future, but also as models of alternative institution building in the face of state hostility, neglect, and apathy. Black placemaking was in the 19th century and remains in the 21st century a strategy to protect against state violence in its myriad forms at all levels of government. The future of water in these places therefore depends as much on the durability and reimagining of community institutions like the West End Revitalization Association and the Alabama Center for Rural Enterprise as it does on the future violence (fast and slow) of the state against these communities. As we finish this chapter of In Conditions, at the beginning of a scary (and clarifying) political era, I am reminded that Black places formed in nearly impenetrable swamplands to escape state violence in its older form--chattel slavery. And then again on the lands of former plantations to escape state violence in another form--sharecropping. And then again on the lands of the North, Midwest, and West to (unsuccessfully) escape state violence in yet another form—Jim Crow. And then again on whatever land they could access to try to escape state violence in its more current form—systemic resource exclusion. At every turn, Black places created institutions with strategies for thriving communities—local aid societies, fraternities and sororities, guilds, community development corporations, youth groups, freedom schools, and of course churches. This evidence does not negate the hardship of state violence, nor does it demonstrate an infinite Black resilience. It merely models a hope for Black futures that is not linked to the state. I am hopeful for the future of Black places—which are indisputably tied to the future of all places—because of their necessary and persistent imaginings of pathways around the state, irrespective of its brand of violence. Those imaginings are our lessons for future institution building, for future political organizing, for futures that could look very different than the futures we expect. We are indebted to our wonderful community partners, whose work we urge you to support--Omega and Brenda Wilson of the West End Revitalization Association (WERA), to Catherine Coleman Flowers and Ruby Rudolph of the Alabama Center for Rural Enterprise (ACRE), and to John Jackson, former mayor of White Hall. Our sponsors are numerous: Duke University Council for the Arts, Duke Center for Documentary Studies, Duke Nicholas School of the Environment, Duke Environmental Law and Policy Clinic, Duke Department of African and African American Studies, Duke Human Rights Center at the Franklin Center for Humanities, and the Scalawag team.